This morning we had a brief presentation by the cruise director about the town of Boppard and the things to see and do. 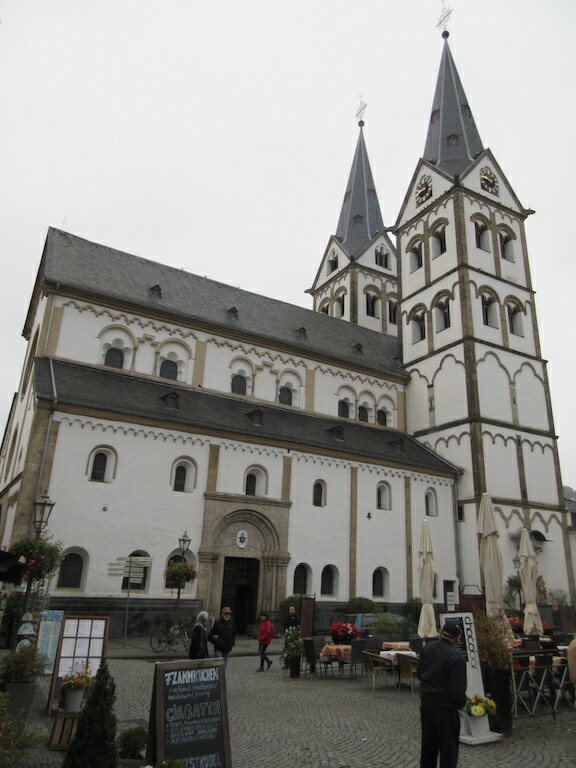 We took our own walking tour around town with our friend, Kathy, to see two of the local churches, the town square and the main shopping street. 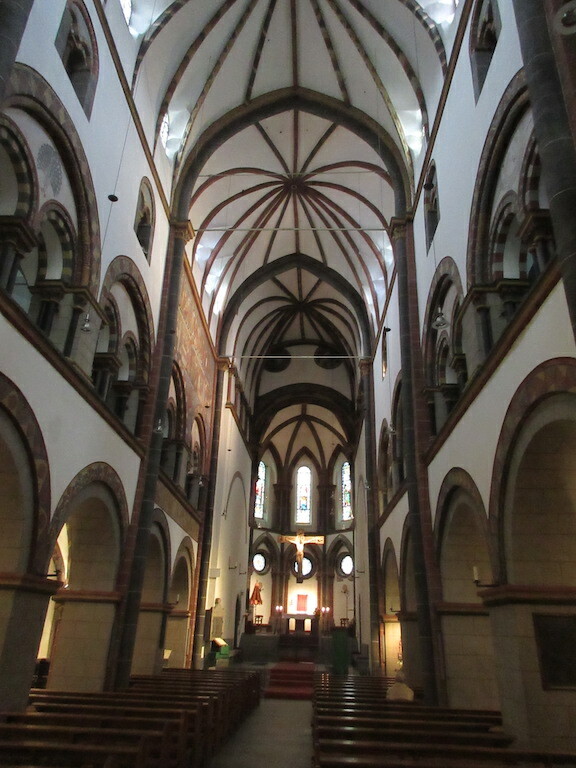 The Church of St. Severus, with its two bell towers, was just beautiful inside with hand painted arches, an ornate altar, along with lovely newer stained glass windows. It gave off a warm and beautiful feeling, unlike many similar churches. 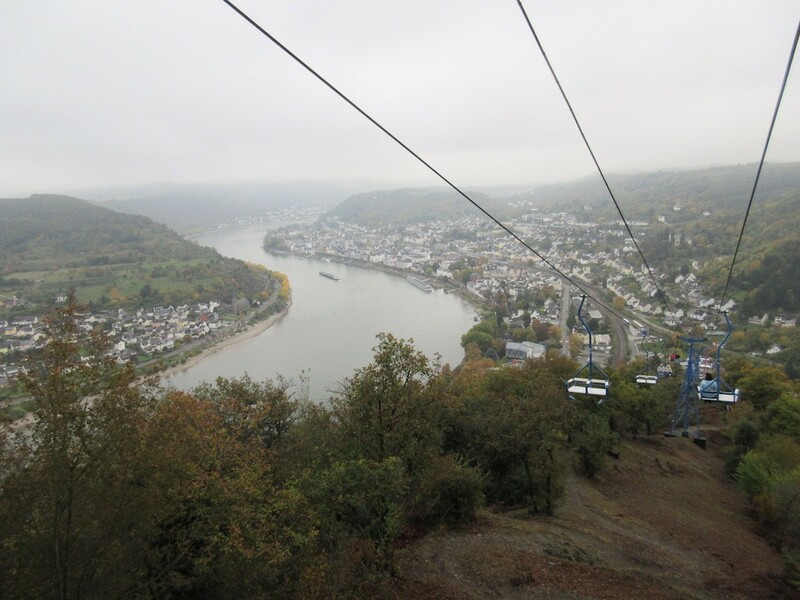 We then took a ski lift for a twenty minute ride up the hillside to a look out point where we could see the hairpin turns the Rhine River makes at this point. The weather was only in the 40’s so it was cold and a bit foggy, but the views over the river were still very nice. Train tracks run along each side of the river providing both passenger service and freight transportation. The river is busy with freighter ships carrying all sorts of commercial goods along the river. For lunch we had a special Oktoberfest lunch with suckling pig, veal, sausages, sauerkraut, pretzels, and many other local favorites. 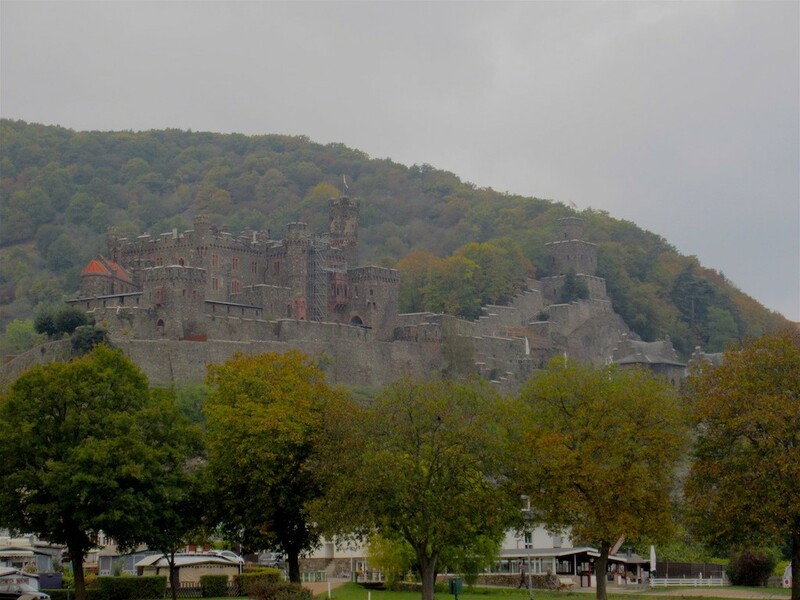 After lunch we cruised the Upper Rhine Valley, considered the most scenic stretch of the river, and a UNESCO World Heritage Site. 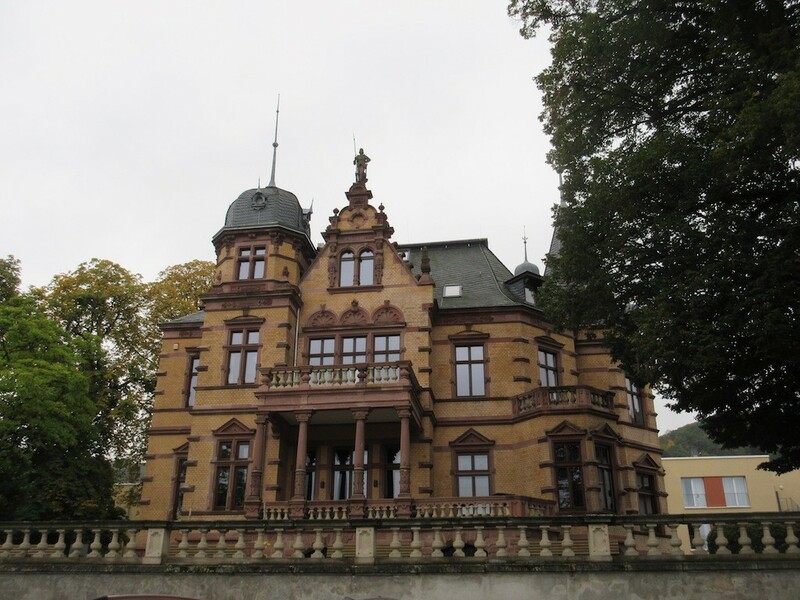 Along this stretch we saw many castles, as well as the famous Lorelei Statue and Rock. In 1801, German author Clemens Brentano composed his ballad Zu Bacharach am Rheine as part of a fragmentary continuation of his novel Godwi oder Das steinerne Bild der Mutter. It first told the story of an enchanting female associated with the rock. In the poem, the beautiful Lore Lay, betrayed by her sweetheart, is accused of bewitching men and causing their death. Rather than sentence her to death, the bishop consigns her to a nunnery. On the way thereto, accompanied by three knights, she comes to the Lorelei rock. She asks permission to climb it and view the Rhine once again. She does so and, thinking that she sees her love in the Rhine, falls to her death. Due to the historic nature of this area of the Rhine, there are no bridges over the river and the area is preserved in its current state. 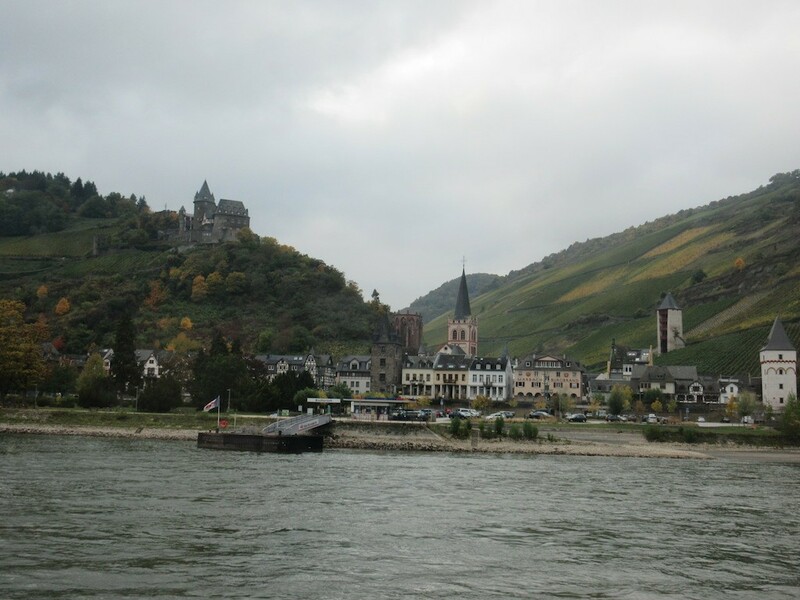 People take water taxis across this part of the Rhine. We arrived in Mainz, Germany about 8:00pm after cruising all afternoon. After dinner about thirty guests headed out to a local bar for the opportunity to see how the locals drink. The bar we visited was a beautiful building that resembled an old church that had been converted to a bar that also served food items. There were many open tables—being a Sunday night it was not too busy. We shared a drink with local passengers before returning to the ship.